Size: 1¾" x 3¼" x 1¼"
Dated: Dated 2012, underside of flower petal. We just started collecting the fairy messenger series, and tiger lily doesn't disappoint. We love her beautiful dress and hair. She's a wonderful addition to our new/old series. Somehow my mom missed this ornament in collecting the garden flower fairies collection. I bought this one to add to the other flowers in the mix. It is actually I think more beautiful out of the box in person than even the picture presents. 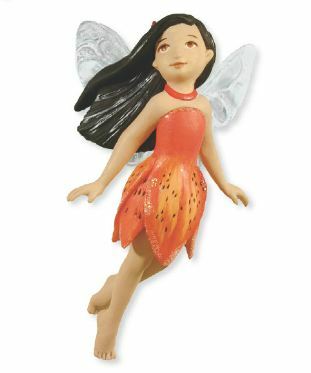 A vibrant orange Tiger Lily inspired fairy was a nice addition to the tree.